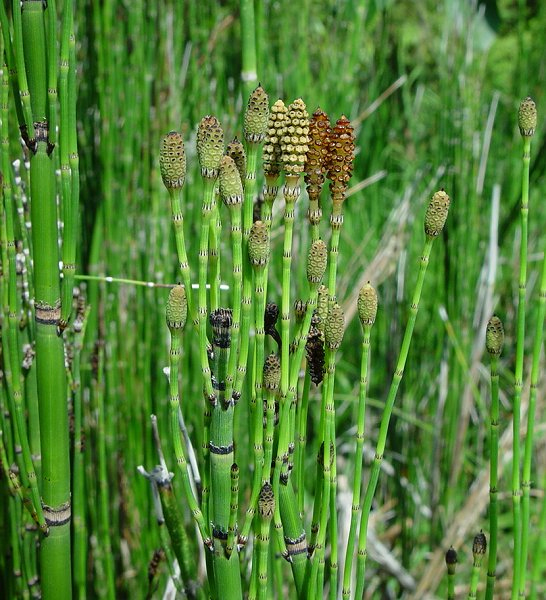 Common Name: Shave grass, Scouring rush. Part Used & Method for Pharmaceutical Preparations: The whole plant is gathered in summer and cut into pieces after the fibrous roots have been removed. Properties & Taste: Sweet and bitter and neutral. Functions: 1. To dispel wind and clear heat; 2. To brighten eyes and remove visual obstructions; 3. To stop bleeding. 1. Wind-heat exterior syndrome or wind and heat in the liver meridian manifested as red eyes, excessive tearing, blurred vision and corneal opacity. Shave grass (Muzei) is used with Pipewort (Gujingcao), Cicada slough (Chantui), Prunella spike (Xiakucao) and Tribulus fruit (Baijili). 2. Hemorrhoidal bleeding. Shave grass (Muzei) is used with Burnet root (Diyu) and Scutellaria root (Huangqin).